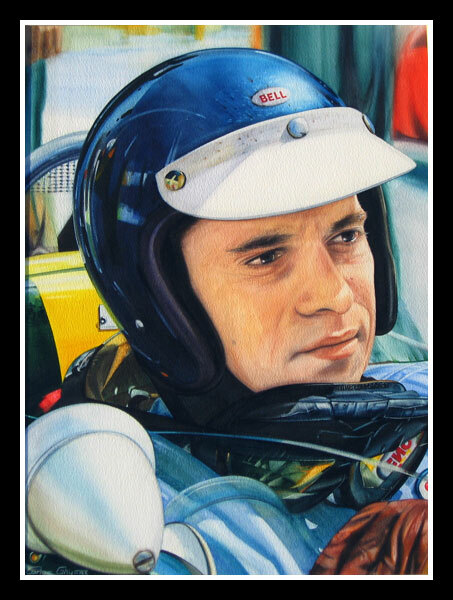 Jim Clark was born on 14 March 1936 in Kilmany, Fifeshire, a border farmer's son who was brought up working on the form. His mild manner and willingness to oblige the public made him one of the most popular drivers ever. Clark's career started at the age of 17 when he won a driving test at Winfield and began to compete in local rallies. He then joined the Border Reivers, and after racing a Lotus Elite against Colin Chapman, he earned himself a drive for Team Lotus in 1960. The partnership of Clark and Chapman thus began, and the Scot would drive for Lotus until his untimely death. His debut came in the 1960 Dutch Grand Prix and as the races went on, so his reputation grew. In 1961 Lotus won its first Grand Prix when Innes Ireland won at Watkins Glen, but the year was overshadowed by the death of Wolfgang von Trips in Italy when Clark's car touched the German's Ferrari which crashed into the crowd killing von Trips and several spectators. Clark recovered his composure and narrowly missed the world title in 1962, making up for it the following year and almost winning the Indianapolis 500. In 1965 Clark became the first Briton to win the Indy 500 as well as being World Champion. Clark dominated Grand Prix racing up until his death, with qualifying performances which were awe-inspiring. His death in a meaningless F2 race at Hockenheim on 7 April 1968 robbed the sport of a gentle, reserved man who was the master of his art.